Why Are Athlete-Led Anthem Protests So Polarizing? What exactly is it about anthem protests that make them so polarizing? It seems an obvious question, and a relevant one these days — but the answers turn out to be surprising. After President Donald Trump exhorted the National Football League (NFL) to fire players who “disrespect” the national anthem, players, coaches and owners from almost every team in the league mounted a defiant response. Before last Sunday’s games, they linked arms — some standing, some kneeling — as flags ascended to the soaring chords of the “Star-Spangled Banner.” Three teams skipped the ceremony altogether. This display of solidarity from NFL players brought renewed scrutiny to the appropriateness of athlete-led protests during “patriotic” proceedings. (The Department of Defense reportedly invested $6.8 million between 2012 and 2015 incentivizing athletes to participate in grandiose displays of national pride.) Conspicuously missing from the demonstrations was former San Francisco 49ers quarterback Colin Kaepernick, the first player to kneel during the anthem as a form of protest. Trump’s disgust with Kaepernick and the other defiant NFL stars betrays a puzzling yet widely held conviction that patriotism precludes dissent, that its symbols are far more sacred than its meaning. But these are fraught times that we live in. And fraught chapters in US history have often beckoned the fusion of sports — the great unifier — and politics — the great divider — to illuminate social and racial injustices. 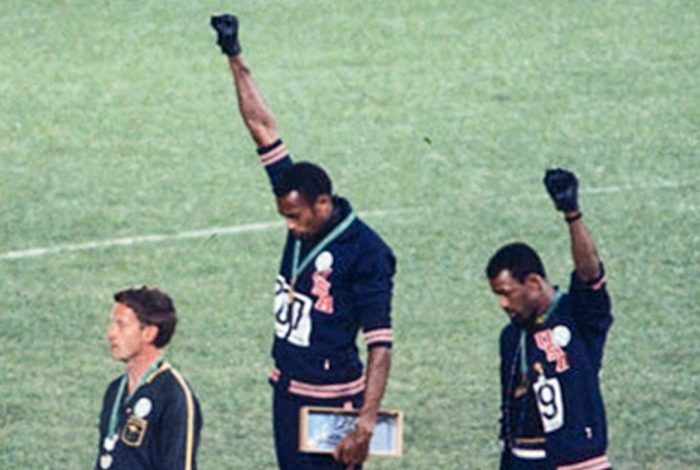 Standing atop the medal podium at the 1968 Summer Olympics — just months after Martin Luther King Jr. and Robert F. Kennedy were assassinated — two African American track athletes thrust their gloved fists in the air in a black power salute, silently decrying segregation and racial bloodshed while the “Star-Spangled Banner” reverberated across the stadium. In 1996, the NBA suspended Muslim guard Mahmoud Abdul-Rauf for sitting during that same tune. He considered saluting the flag as not only an endorsement of oppressive values and but also an affront to Islamic teachings. Parks — whose name feels like an artifact from a distant but not so dissimilar past — elevated passive resistance to a form of protest art: her gesture, though largely symbolic, became a vehicle for social progress. She remained seated not because she hated standing but because she hated being a second-class citizen. Similarly, argued The Root writer Michael Harriot, King, John Lewis and other Bloody Sunday marchers didn’t risk their lives out of disdain for the Edmund Pettus Bridge — they did it to secure the right to vote. Kaepernick and the NFL were less interested in undermining cherished practices and institutions than in pursuing the ideals they embody. The song, like the bus, is but a megaphone through which any American citizen can voice grievances. Watch the videos below to learn more about the similarities between Kaepernick’s anthem protest and Parks’s bus boycott, as well as the polarizing reactions prompted by the former. Related front page panorama photo credit: Adapted by WhoWhatWhy from flag field (Fort George G. Meade Public / Flickr – CC BY 2.0).